While my brother was here Jon flew out to Texas to check out the law school we were planning on attending and to find an apartment. Towards the end of the trip I get a phone call from Jon telling me that he just isn't sure about this and about moving us to Texas. He tells me the apartments we can afford are near a prison and all have curfews due to gang activity. 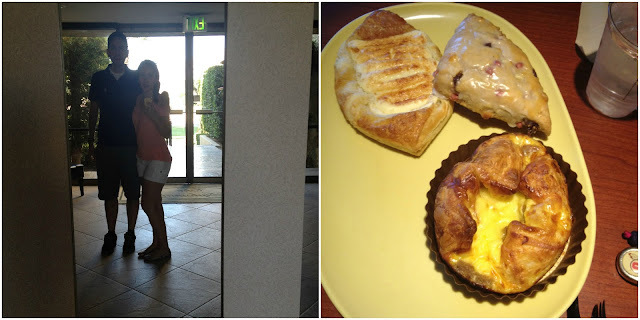 We log onto an apartment review site and the things that were on there were frightening. After thinking long and hard about it we decided we just couldn't move out to Texas 22 hours away from the closest family member. It just didn't feel right. Right before Jon left for Texas he had gotten an acceptance letter from a school in Los Angeles that we had applied to just for fun. After praying and thinking about what we needed to do after Texas was a no we felt we needed to drive up to Los Angeles and at least check out the school and see how we felt about it. We knew nothing about the school really or where it was. As we drive in we find out that it's smack in the middle of Koreatown. Have I ever mentioned that Jon served his mission in Korea and still speaks, writes and reads Korean perfectly? Well he does. He loves anything Korea so driving into Koreatown felt like home to him. We find out that the school is right in Koreatown but there are a lot of Central Americans that live here too, so like my people, what? Maybe it was a sign who knows but we took a tour of the school and drove around the neighborhood and almost on the spot decided this was it. It just felt right. We put our seat deposit the very next day. After that we got a hotel room for the night right by the beach to take Bentley to the beach for the first time ever. The boy was in heaven. I'm not sure what he had more fun with if it was the water or the sand but he had more sand in his hair than I thought possible. He didn't want to leave the beach even after dark. We had a fun little getaway. The next day we headed back into downtown LA to visit apartments and found our perfect new home. Then we decided to drive to Santa Monica since I had always heard amazing things about it. On the way there we drove by the LA temple, which is beautiful. We past Beverly Hills and Rodeo Drive. After forever due to LA traffic we made it to Santa Monica which was just as beautiful as I had imagined it but by then it was too late to get out so we just did a drive by. Shortly after our LA trip Bentley began swim lessons, He had been asking for them for a year now and I figured this was the year to have him learn. He really is awesome in the water with his water wings so it was time to have him learn for reals. He has been loving his swim lessons and learning so fast it has me scared. At the end of the month we had family come into down so to the lake house we went for the weekend and we had a relaxed weekend filled of fun times jumping and swimming in the lake and boating. As it turned out my brother had a whole week in June off from work and it happened to be that week I left Utah. He had been dying to come out and visit us and of course I am always up for having my brothers hang with me so I was super excited I was going to have someone to drive with back to California and to hang out with me for a week. We had a fun week filled of pool time, exercising, spa time with Jon and going up to the mountain for a little getaway. 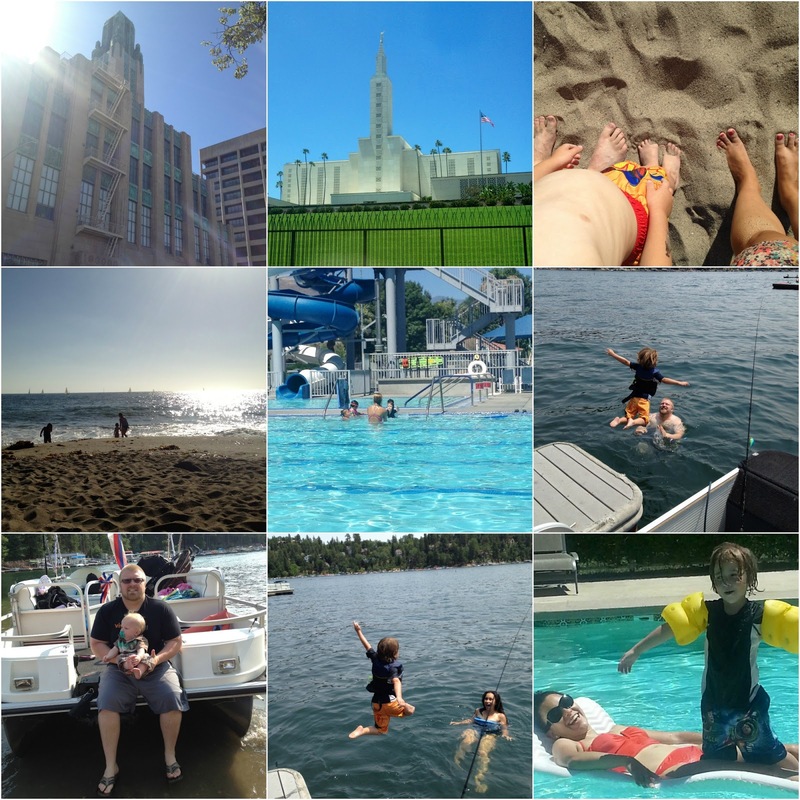 My brother said this was the best trip to California ever which meant a lot because I tried my best to make it the best. 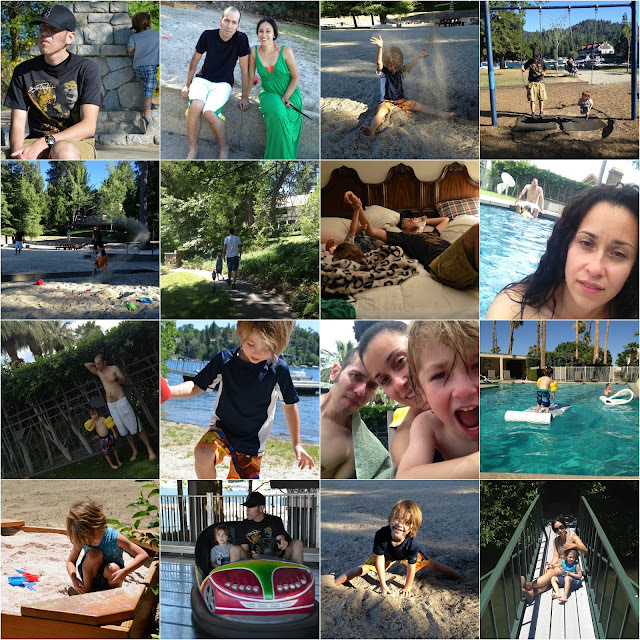 We had a blast at the lake house playing games, talking till late and playing in the sand along with go carting. I did get sick right after getting to California with whatever Bentley had and shortly after my brother caught it while on vacation but thank goodness he was able to go to the spa and enjoy the steam room and sauna and sweat most of the illness out or at least I told myself that. Then came time for him to go home which is always sad for me to have to say goodbye. So I woke up early and took my brother out for breakfast just the two of us. It felt so good just to go out with my brother and get to talk to him while we had breakfast. That will be one of my favorite things I will remember from that trip forever. I love my brothers and miss them like crazy, other than Jon and Bentley they come next. So glad I was able to have both my brothers visit me this summer. The last few days in May my sister in law and I drove out to Utah with the kids to hang out in Utah with family. Our drive to Utah was pretty fun. Lots of talking and getting to know each other and lots of laughing. I drove all the way through and got in around 2 in the morning. My plan was to stay in Utah for over 15 days. I stayed at my other sister in laws house for about 5 days and of course Bentley was over the moon cause he got to hang out with his all time favorite cousin for 5 days straight. 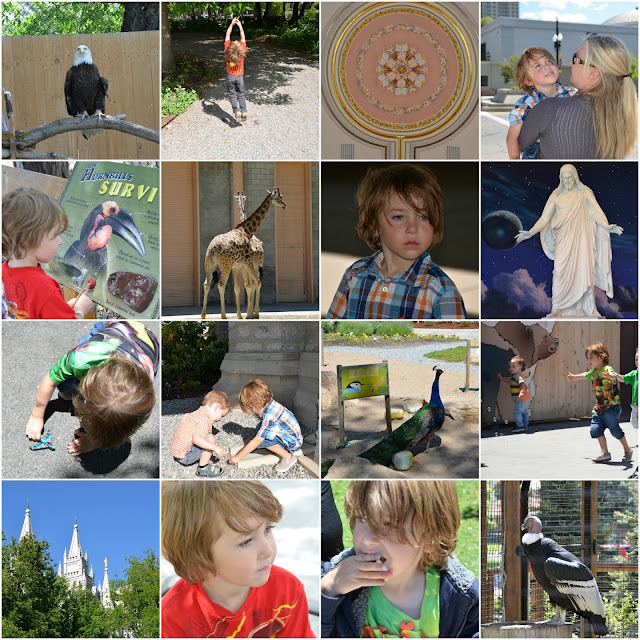 We got to take the kids to an aviary, the zoo and temple square along with the kids playing all day long. By day 5 however Bentley came down with a fever and not wanting to get up or do anything which always makes me worry since this boy always have energy even when sick so that's how I know he isn't feeling well. Thank goodness we had already had tons of fun with his cousins. Since Bentley wasn't feeling well I figured it was time to head up to my moms house so I could get some help with Bentley as he normally gets super needy when he is sick. My mom was more than happy to have us there earlier than expected. At my moms house we just laid low and got some much needed rest. By the next day Bentley was back to himself so I figured maybe he had been dehydrated or something funky. My brothers played with him tons, took him on bike ride and walks. Then he got to play with his friend that lives in my moms neighborhood. We got to go to a splashpad which was nice since they don't have those out here. We also got to hang out at my cousins house and had a sleepover there. Bentley got spoiled and even got a massage by tia Lissetti. Bentley also got to help my mom is the garden which always turns into him soaking my mom and my mom soaking him back, probably one of his favorite things to do with my mom. One night after my father came home from work we went out fishing all as a family and that was really fun and peaceful. Getting to see those beautiful mountains and getting the summer breeze was heavenly. I do love Utah! Another day Bentley got to go on a date with my parents, they took him to his favorite kid museum, which he had asked for and then took him to their favorite ice cream shop where both my parents were forced to give us their ice creams and share with Bentley because he didn't like the one he chose, the beauty of being the only grandbaby they do what he says. 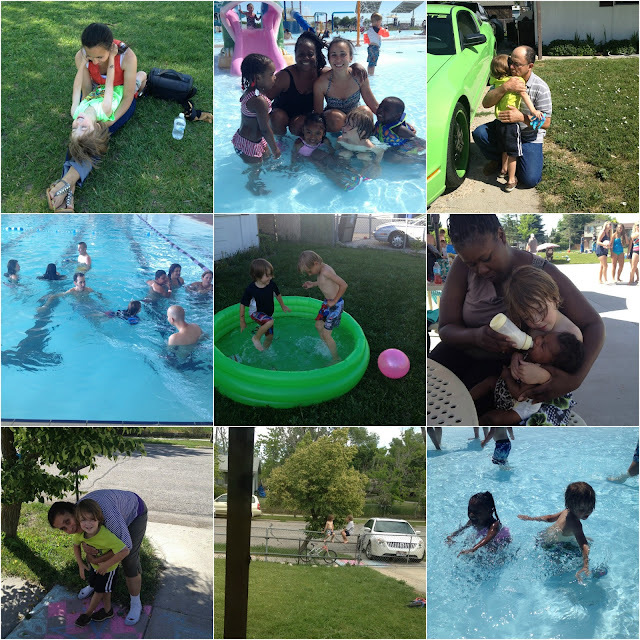 We got to hang out with our friend Tanya and Chewy one day at a pool date which was so much needed. Bentley had so much fun and I did too with Tanya she sure knows how to have a crowd laughing nonstop. 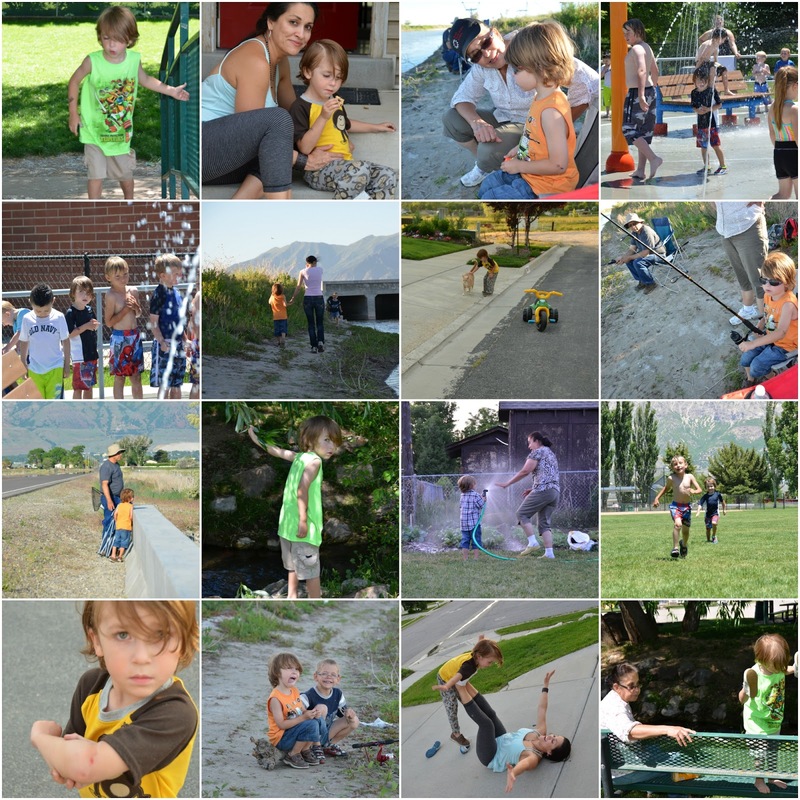 Shortly after that Bentley came down with pink eye which was no fun, he became super needy and wanted to badly to play with other kids but knowing he had pink eye I didn't want him giving it to someone else so I made the decision to leave Utah 6 days earlier than expected. I was pretty bummed since I didn't get to see most of our friends that I was planning on seeing.